SC-Worldwide formed ODES UTVS in August 2011 to play the role of Importing and Distribution. Run by good ol' American Industry guys, ODES will now pave the way for a new breed of Asia UTVs in the market not only in the USA but also worldwide. Hisun Motor Corporation might not be the most familiar name in Powersports, but there’s a good chance you’ve already enjoyed one of our many UTV’s or ATV’s. For years, Hisun Motors has provided products for some of the biggest names in UTV and ATV markets. SSR Motorsports is best known for our vast line-up of pit bikes, everything from entry-level to race-ready and race-winning competition models, to sport and utility ATVs, "side-by-sides" and two-seater buggies. We expanded into the street-legal scooter market. At Tao Tao we are committed to safe use of All Terrain Vehicles. 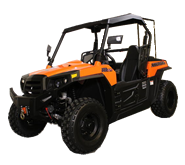 Tao Tao ATVs meet or exceed the ANSI Standard as required by LAW (SIA of 2008). With 100% of all parts available right here in the U.S. you won't have to wait to get your equipment back on the road when you order with us. KFI Products is a family owned and have been in business since 1986 and Incorporated in 1990. In 2002 we decided to start some of our own products and we engineered our very first KFI ATV Winch Mount. We have also added products such as KFI winches and other accessories to help compliment our manufactured products. Lean Enterprise: Continuous improvement in products and processes, personal growth for all team members, systemized approaches to everything we do and doing more with less. Getting it done right: Always on time, being laser focused and having the most dedicated and committed team. Do the right thing: Honest, Integrity and Respect are the values instilled in everyone at FLOE. © 2013 Altimate Motorsports. All Rights Reserved. Website by Badgerland Marketing.